Open vSwitch is a multilayer software switch licensed under the open source Apache 2 license. Our goal is to implement a production quality switch platform that supports standard management interfaces and opens the forwarding functions to programmatic extension and control. 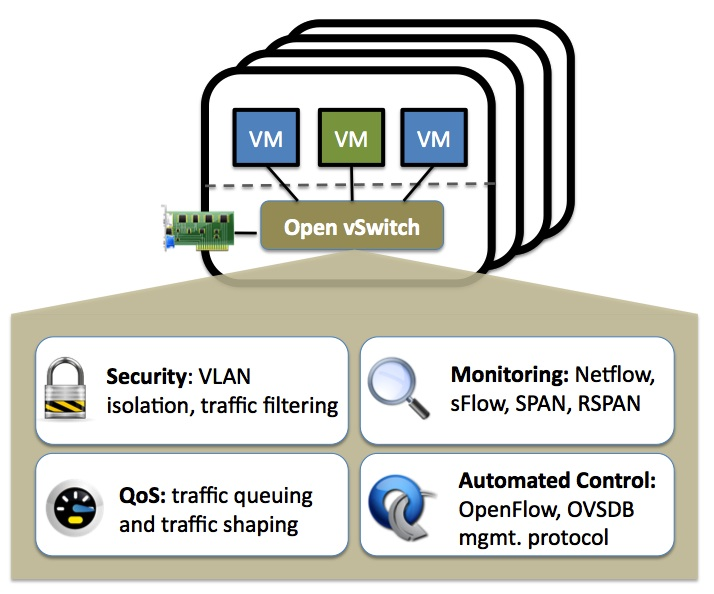 Open vSwitch is well suited to function as a virtual switch in VM environments. In addition to exposing standard control and visibility interfaces to the virtual networking layer, it was designed to support distribution across multiple physical servers. Open vSwitch supports multiple Linux-based virtualization technologies including Xen/XenServer, KVM, and VirtualBox. The included Linux kernel module supports Linux 3.10 and up. Open vSwitch can also operate entirely in userspace without assistance from a kernel module. This userspace implementation should be easier to port than the kernel-based switch. OVS in userspace can access Linux or DPDK devices. Note Open vSwitch with userspace datapath and non DPDK devices is considered experimental and comes with a cost in performance. ovs-vswitchd, a daemon that implements the switch, along with a companion Linux kernel module for flow-based switching. ovsdb-server, a lightweight database server that ovs-vswitchd queries to obtain its configuration. ovs-dpctl, a tool for configuring the switch kernel module. Scripts and specs for building RPMs for Citrix XenServer and Red Hat Enterprise Linux. The XenServer RPMs allow Open vSwitch to be installed on a Citrix XenServer host as a drop-in replacement for its switch, with additional functionality. ovs-vsctl, a utility for querying and updating the configuration of ovs-vswitchd. ovs-appctl, a utility that sends commands to running Open vSwitch daemons. ovs-ofctl, a utility for querying and controlling OpenFlow switches and controllers.